Four exceptional women founded SWG in 1925: Marguerite Harrison, Blair Niles, Gertrude Shelby, and Gertrude Emerson Sen. These recognized explorers wanted to bring together women who shared ambitions and interests in exploration and achievement, exchange knowledge derived from field work, and encourage women pursuing geographical exploration and research. In naming their organization the Society of Woman Geographers, the founders intended the word "geographer" in its broadest sense. In the Society's early years, there were still many unknown places and populations to be visited and studied, and Society members were in the vanguard of courageous explorers. Air transportation was just beginning when one of the first SWG members, Amelia Earhart, made her solo flight across the Atlantic. Margaret Mead pioneered much of modern anthropology. Mary Douglas Leakey helped discover the earliest humans at Olduvai Gorge in Africa. With time, as communication and transportation have made the world a smaller place, and opportunities for women have expanded, there is still a place for an organization devoted to multidisciplinary intellectual exchange and support among women. Today our 500 members are connected in ways our founders could not have imagined. We have grown from a single group in New York to a total of five nationally, adding Washington D.C. (our headquarters), South Florida, Chicago, and The Bay Area. Each group meets several times between September and May to hear from a member or guest reporting on research or unusual travel. A growing group of At-Large members, who do not live near a group, keep in touch and are welcomed at any group meeting. We also have Members, who reside outside of the United States, currently in twenty-seven countries on five continents. Every three years we hold an international conference, the Triennial. At this meeting we may award a Gold Medal, an Outstanding Achievement Award, or a Ronne Award to members of particular distinction. 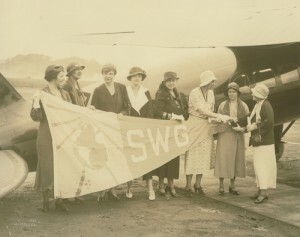 In 1931, SWG established a flag carrying program. Members have carried the flag on expeditions to the top of Kilimanjaro to Antarctica and from the depths of the ocean to outer space. SWG has also awarded over hundreds of fellowships to women studying for advanced degrees in geography or its allied fields, as part of carrying out the vision of our founders to "further geographical work, to spread geographical knowledge, and to encourage geographical research." In 1991, SWG aquired a building on Capitol Hill where the Society maintains a museum and library. A collection of Oral Histories of notable members is also available to researchers in tape or transcript form and the Library of Congress contains the papers of past members of SWG for researchers interested in their work.